Anybody know how to use this? I can't find any info on the web. I have use of one but can't figure out how to use it.Thanks. Actually it's a little hard to see with the wheel in the background could you take another angle? That is a front end lift, I have one like it. The pin in the arm goes into the center of steering stem in the lower clamp. Then the crossbar goes into the hooks at the top and you rock the stand under it to lift the bke. Adjust the height first and please have a helper to steady the bike! How about a picture of it holding up the front end of a bike? Just google triple tree stand and select images. My bikes and stand are not where I can demonstrate it anytime soon. 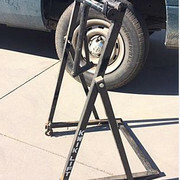 I have been using a Pit Bull front stand for about 15 years on at least 6 different motorcycles. Like so many purchases you feel the pain of purchase only once but appreciate the pleasure of a well built product for years and years. The is not mine, took off a forum, only place I found it. Lift is 55 miles away at the moment so no photo for now. Thank you Hunter for directions how to use it. Would not a short hydraulic jack with a board on top under the sump be a way simpler to raise the front wheel off the ground? But maybe that is not your objective.